Cathal Brennan looks at a rare, and fleeting, victory for an independent left-wing candidate in the conservative climate of 1950s Ireland. In 1957 Jack Murphy was elected as the candidate of the Unemployed Protest Committee to put the issue of unemployment to the centre of political debate in Ireland. Since the establishment of the Free State, unemployment and emigration had been a constant problem. The Irish National Unemployed Movement had been founded in 1926 and branches were formed throughout Ireland, north and south. Irish socialists were heavily involved in the unemployed movement and used the issue to recruit activists to class politics and to highlight the failure of the two new states to address social problems. The 1950’s in Ireland was a period of unemployment and high emigration. While most countries in Western Europe enjoyed a post war boom during the decade, the Irish economy stagnated. The economy faced deteriorating terms of trade and the relentless pursuit of deflationary policies discouraged investment in manufacturing and inhibited export development. While most countries in Western Europe enjoyed a post-war boom, the Irish economy stagnated. By 1955 there was a balance of payments deficit of £35,000,000 and agricultural exports had declined considerably. With high unemployment, emigration figures soared, with around 40 -50,000 people leaving the country every year. The second Inter Party government was in office from 1954 to 1957. The government was a coalition of Fine Gael, Labour, Clann na Talmhan, Clann na Poblachta and independents. The radical left were small and marginalised due to the intense anti – communist sentiment in Ireland at the time. The opposition party, Fianna Fáil, were still led by Éamon de Valera, who in 1957 was seventy five years old and almost completely blind. From that meeting they organised an Unemployed Protest Committee and they secured a committee room in the premises of the Dublin Trade Union Council and a grant of £2. The committee was made up of sixteen men with an average age of under thirty and all but three were married. From the outset the committee was dominated by members of the small Irish communist movement. 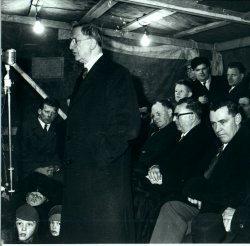 The Committee organised a series of public meetings and demonstrations throughout Dublin. Meetings were called outside labour exchanges in the city and support for the movement grew. Marches were usually preceded by home made black coffins, which had been a symbol of unemployed marches for many years. Towards the close of 1956, the coalition government collapsed under the strain of economic problems and a dramatic outbreak of violence along the Irish border. 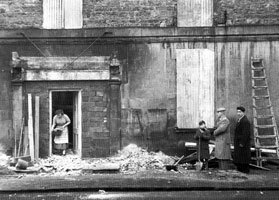 The RUC barracks at Lisnaskea - damaged by an IRA attack in December 1956. In December of 1956 the IRA launched Operation Harvest, a series of attacks on border fortifications in Northern Ireland. Gardaí were instructed to round up known republicans under the Offences Against the State Act and within days senior IRA personnel were being arrested in Garda raids. The National Executive of Clann na Poblachta met on the 26tth of January and voted for its TDs to withdraw support for the second Inter Party government. The UPC decided that the election would be a great opportunity to focus attention on the plight of the unemployed and to make jobs the central issue of the campaign. Appeals were sent out for financial support and subscriptions were received from several trade unions, particularly in the construction sector, and also the Dublin, Belfast and Derry Trades Councils. There was a long history of socialists and the left wing of the IRA working together on issues of common concern. From the Civil War, through to opposition to the Cumann na nGaedhael government and the Blueshirts, to the attempt to join forces in the short lived Republican Congress, the two tendencies cooperated through a shared anti-imperialism. The Republican Movement had struggled for a long time between those who thought the movement should embrace left wing agitational politics and those who felt these issues were a distraction from the main objective of securing a 32 county republic. Jack Murphy was the thirty seven year old secretary of the UPC. He had joined the Fianna at age ten and then the IRA when he was sixteen. A militant shop steward, he had led a strike at the Poulaphouca dam project when he was an apprentice that had lasted several months. In 1941 he was interned for his republican activities and spent the rest of The Emergency in the Curragh. On returning to his trade after the war he was again elected as a shop steward and took part in many strikes. In 1956 he emigrated to England to find work but returned to Ireland after four months. Murphy was a practicing Catholic and believed that the church had a positive role to play in pressuring the government into implementing policies to deal with unemployment. The Labour Party chose James Connolly’s son, Roddy, to fight the election despite the fact that he had no real relationship with the constituency. Connolly’s prospects weren’t helped by the decision of many Labour Party members in the constituency to campaign for Murphy. On the other hand the UPC ran a vigorous campaign and as Nolan wrote they had, ‘one asset the others hadn’t. It had willing, unemployed men who went out in great numbers to spread Jack Murphy’s name and his message of revolt.’ Unemployed painters hand painted hundreds of posters and whitewashed slogans all over the constituency. The campaign drew huge attention to the issue of unemployment and attracted left wing activists from all over Dublin. The general election was held on the 5th of March 1957. Jack Murphy took a seat in Dublin South Central with 3,036 first preferences. Both the Labour Party and Clann na Poblachta failed to get seats in the constituency. Eamon De Valera, returned as Taoiseach in 1957. In the general election, Fianna Fáil won 78 seats and was returned to government with an overall majority. The election was a poor result for the government parties. De Valera returned as Taoiseach with his largest majority ever. Fine Gael lost ten seats; Labour lost seven, Clann na Talmhan lost two while Clann na Poblachta was reduced to a single seat in the Dáil. Sinn Féin won four seats, and over 65,000 votes, which they refused to take as abstentionists. Murphy’s profile as an ex – IRA man and a former internee must have been a bonus to his campaign in the circumstances. The deaths of Seán South and Fergal O’Hanlon, during the failed attempt to attack Brookeborough RUC barracks in January of 1957, had created huge sympathy for the IRA and over 50,000 people attended their funerals. Unfortunately for the Labour Party, their period in the Inter Party government of 1954 – 57 was marked by high unemployment, high emigration and high prices. The election results appeared to vindicate the stance of the anti – coalitionist left within the party who argued that coalition with Fine Gael could not deliver to results to Labour voters. Murphy’s victory was viewed as a tremendous result by the left in Ireland. Murphy had difficulty trying to get answers to even the most basic questions in the Dáil. He could not even get an answer to how much unemployment relief money was being spent in Dublin. In May Murphy and two other members of the UPC, Tommy Kavanagh and Jimmy Byrne, began a hunger strike to highlight unemployment and to protest against the removal of food subsidies in the budget. The hunger strike lasted four days and each evening thousands of protestors gathered on the corners of Abbey Street and O’Connell Street. Resolutions of support came in from trade union branches all over the country and there were demands for a one day strike. Murphy then fell ill and Kavanagh and Byrne called off the strike on the fourth day. To save face, the UPC arranged for trade union leaders to appeal for its end in order to avoid loss of life. The way the hunger strike fell apart led to confusion and demoralisation in the movement. Activists such as Sam Nolan felt that the Committee should focus on protests that included the wider community and in that way politicise them, rather than engage in individual actions such as hunger strikes. Two days later, over three thousand women, many pushing prams or carrying children in their arms, marched to Dáil Éireann on the 22nd of May before attending a rally at College Green. 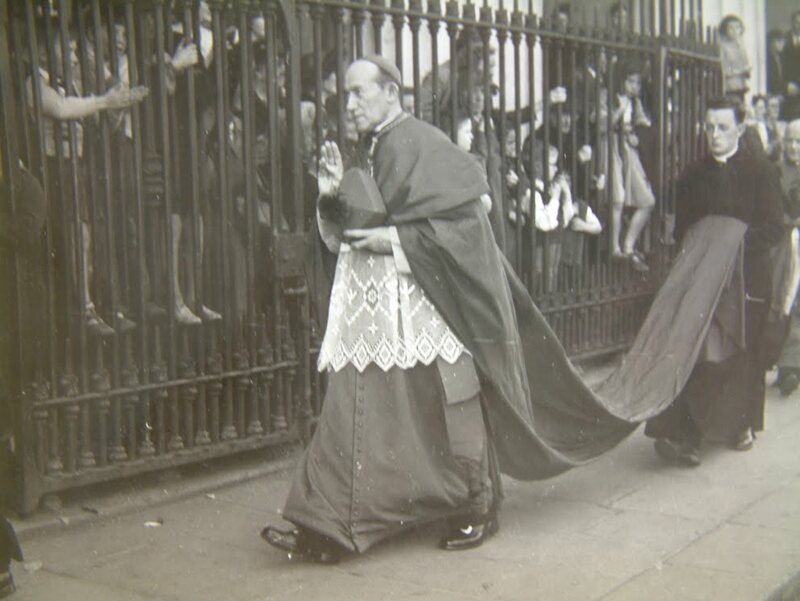 Following the hunger strike Murphy had a meeting with the Archbishop of Dublin, Dr. John Charles McQuaid. McQuaid warned Murphy about the dangers of associating with communists and urged him to break with the UPC. He warned Murphy that Sam Nolan was the most dangerous man in the country and to break his ties with him. The last big demonstration of the campaign saw 2,000 protestors march from Seán McDermott Street to the Dáil but Murphy opposed the march saying it conflicted with his Dáil work. In August he broke with the UPC and the following year he resigned his seat, which was won by Fianna Fáil in the bye-election. Murphy emigrated to Canada shortly afterwards. The article was referring to Dr. Noel Browne, the Minister for Health who resigned following his failure to get his cabinet colleagues to back his Mother and Child Scheme after the hierarchy had expressed their opposition to the legislation. He caused a sensation by subsequently publishing the correspondence between himself and the bishops. The UPC showed the potential for a borader campaign, unfortunately it proved to be another false dawn for the Irish left. The election of Murphy also shows the disillusionment many felt with the Labour Party. After the two Inter Party governments there were very few tangible benefits they could show to their supporters. Although the UPC campaign ended in a fiasco with Murphy’s resignation it showed the potential for a broader campaign that would include the unemployed and working class throughout the country. Without the safety valve of emigration the state could have faced massive social turmoil due to the high levels of unemployment during the decade. Unfortunately for those involved, the UPC represented another false dawn for the Irish left. Communist Party of Ireland – An Outline History (Dublin, 1974). Daly, Mary E., The Slow Failure Population Decline and Independent Ireland 1922 – 1973 (London, 2006). Jackson, Alvin, Ireland 1798 – 1998 (London, 1999). Lee, J.J., Ireland 1912 – 1985 (Cambridge, 1989). King, Joe, Workers Solidarity #33 (Dublin, 1991). 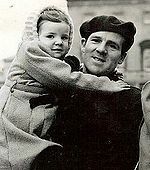 Purséil, Niamh, The Irish Labour Party 1922 – 1973 (Dublin, 2007). The Irish Democrat, #148 (London, April 1957). The Irish Democrat, # 162 (London, June 1958). Lee, J.J., Ireland 1912 – 1985 (Cambridge 1989), p. 325. Jackson, Alvin, Ireland 1798 – 1998 (London 1999), p. 316. Communist Party of Ireland – An Outline History, p. 59. The Irish Democrat, (London), April 1957, p. 5. Purséil, Niamh, The Irish Labour Party 1922-73 (Dublin, 2007) p. 197. Irish Times, 29 Jan, 1957. Purséil, Niamh, The Irish Labour Party 1922-73 (Dublin, 2007) p. 196. Purséil, Niamh, The Irish Labour Party 1922-73 (Dublin, 2007) p. 198. Purséil, Niamh, The Irish Labour Party 1922-73 (Dublin, 2007) p. 200. [28} The Irish Democrat, (London), April 1957, p. 5. King, Joe, “When the unemployed elected their own TD“, Workers Solidarity 33 (1991). Daly, Mary E., The Slow Failure (London 2006), P. 202. The Irish Times, 20 May, 1957. Daly, Mary E., The Slow Failure (London 2006), P. 203. The Irish Democrat, (London), June 1958, p. 1. Lee, J.J., Ireland 1912 – 1985 (Cambridge 1989), p. 327. Communist Party of Ireland – An Outline History, p. 57. Written by: Cathal Brennan on 9 July, 2010. Last revised by: John_Dorney3 May, 2012. 14 Responses to "The Election of Jack Murphy in 1957"
glad I discovered this site — via Twitter. This hidden history of Ireland deserves to be better known. Congrats on your excellent work. Thanks for the kind words! Would welcome any contribution you’d like to make! Great article. One small thing. The picture you have of Sam Nolan is not him, but Joe Deasy, who was a contemporary of Nolan in the Irish Workers League. Thanks so much for the feedback! I’ll update the caption! PS: if you’d like to contribute, you are more than welcome! Thank you Eddie and Conor. Conor, I came across Dublin Opinion about 12 months ago and really enjoy reading it. I think there is some very interesting articles on the site. Congratulations on the interviews you did with Sam Nolan on vimeo. They will become very important historical references in the years ahead. Thanks very much Cathal. The interviews are conducted by Mick O’Reilly and myself, but really Mick is the main person. I just film them. With Sam, we have about 11 hours of footage! He talks a lot about his childhood and Dublin in the 1930s, his involvement with the communist movement, the Dublin Housing Action Committee, the Tax Marches in the 1970s, the Labour Left group in the 1980s, as well as his time as a trade union activist. If you want to watch any of the footage just let me know. Thanks for that Cathal, wasn’t clued into those interesting facts, especially Jack Murphy re 1957. Thanks Conor. I really think you should upload all the footage you have of the interviews with Sam Nolan. There would definitely be a lot of people interested in looking at them. Over Christmas I came across an article in the Irish Labour History Society journal, Saothar, on Jack Murphy. It’s written by John Johnstone – Kehoe and is the most detailed article I’ve read so far on Murphy’s life and the Unemployed Protest Committee. It’s in the 2009 journal (No. 34) and is well worth a look for anyone interested in the subject.